Zlatan Ibrahimovic’s doctor has warned the striker not to rush his Manchester United comeback. Ibrahimovic tore his anterior cruciate ligament against Anderlecht in April in the Europa League. Dr Freddie Fu, the specialist who operated on him, wants the striker to have as much recovery time as possible. “He is very strong but soccer is still a combative sport,” he said. “As a doctor, of course I want to see him return as slow as possible, only when he is fully fit for the game. “There have been many cases of a player returning prematurely with bad consequences. “I have no worry about his injury as it always takes time to fully recover.” Ibrahimovic was United’s top scorer with 28 goals last season, and although his contract ended in the summer he signed a new one-year contract while recovering from his serious knee injury. 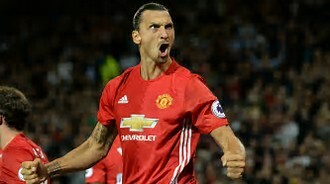 Ibrahimovic has been included in Manchester United’s Champions League group stage squad but no date has been given for the Swede’s comeback.